Encircle is transforming the property and casualty insurance industry. With industry-leading web and mobile tools, policyholders, insurers, and services providers are connected on a single platform creating a streamlined claims process. Instantly connect the field and office on a single, digital platform. No waiting for paperwork, emails, or faxes. Process claims and inspections faster while providing more visibility and communication to your customers. Build trust with stakeholders and customers by making it easy to gather, share, and access information. Proactively manage your workflow by reducing administrative burden and unnecessary tasks to drive efficiency and cost-savings. Start your 2 week FREE trial of the #1 documentation and productivity tool for restoration and insurance. 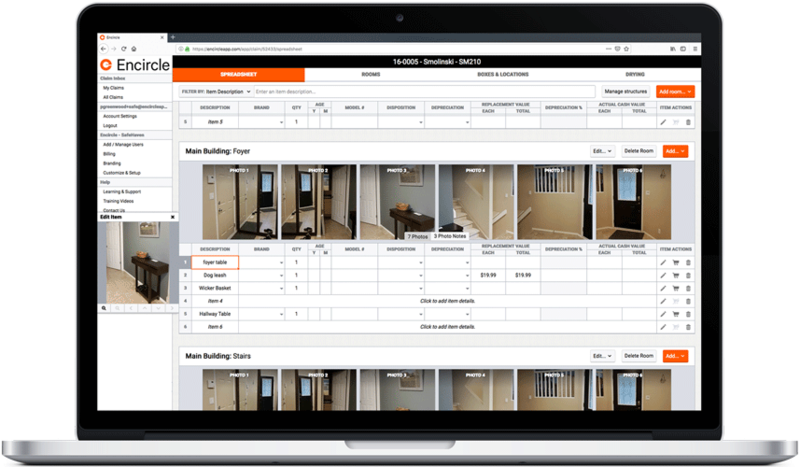 Real-time visual workflows allow you to see the severity of a loss without having to leave your office. Easy-to-use, intuitive web and mobile tools that generate powerful results. Access and share the information you need, when you need it on a single platform. Quickly and accurately document the contents of a property for FREE using your mobile device. “I used Encircle on a CAT we travelled to recently…game changer! Encircle kept everything moving. From my estimates to the technicians, and back to the office. The best part? It was all paperless!" Request a free personalized demonstration of Encircle now!